I was right about some things concerning this year’s Chelsea Flower Show; the weather was better; most designers defaulted to the tried and tested formula of multi-stemmed trees underplanted with tight-knit perennials; and Alan Titchmarsh’s garden was far from cutting edge – more of a blunt axe one might say. However I was wrong about one thing, and that was The Telegraph Garden. Having suggested the garden might be a little suburban, I now have to eat my hat. I’d happily eat two if the designers Tommaso del Buono and Paul Gazerwitz asked me to, so far adrift was my assessment. Any similarity to a suburban garden ended with the rectangular-shaped plot, the rest was pure, carefully considered, contemporary genius. Tommaso grew up in Florence, which explains something about the strength and structure of the duo’s second design for a Chelsea garden. References to the gardens of the Italian lakes and Renaissance palaces run throughout, without ever surfacing in an overt or crass way. 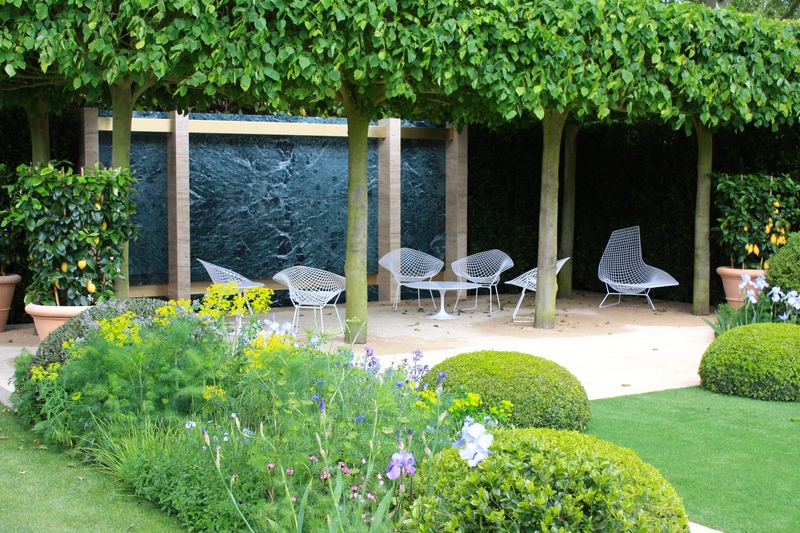 Common limes (Tilia x europaea ‘Pallida’) are trained and pruned to create a tabletop of foliage, giving shade to the seating area and lemon trees arranged beneath. Then there is clipped box, not shaped like giant exercise balls, but soft, wide and flattened, like beautiful emerald pincushions. Another Mediterranean shrub Phillyrea angustifolia, which sports darker foliage than box, is clipped into similar forms along the boundary of the garden. 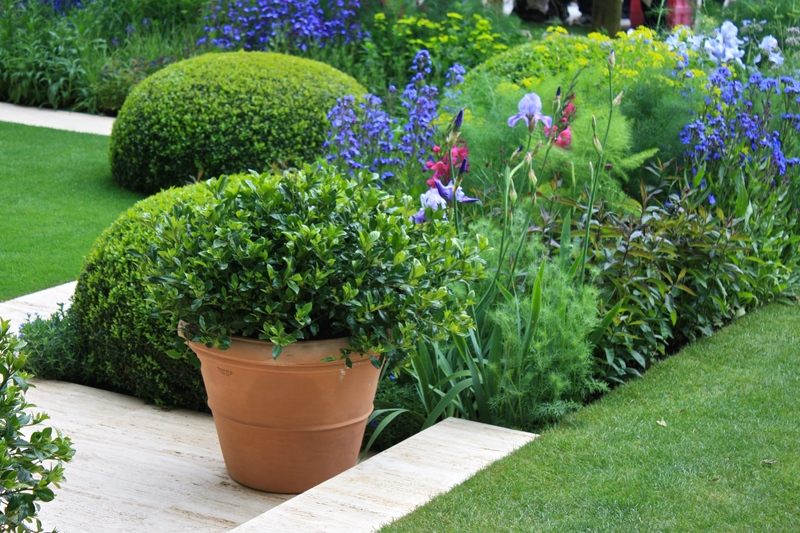 Tuscan terracotta pots planted with Gardenia augusta ‘Florida’ welcome visitors entering from the side axis. The designers’ choice of hard landscaping materials is also resolutely Italian. Half way down the garden the boundary is punctuated by a panel of nougat-coloured travertine limestone, characterised by its watermarked patterning. The brass band above the bench is a refined, glamorous, understated touch; it’s clever details like this that separate exceptional designers from the rest. I found myself completely in love with the white mesh chairs selected for the garden by Tommaso and Paul, designed by Eero Saarinen and Harry Bertoia in the 1950s and still in production today. 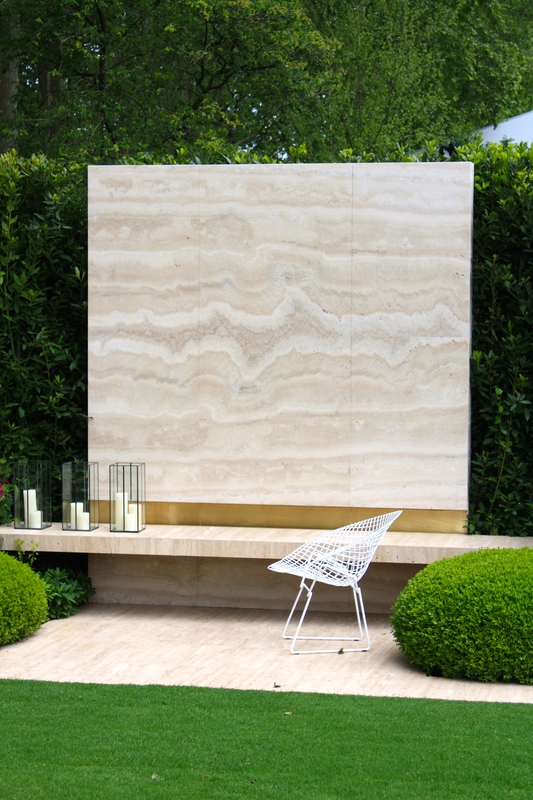 Behind the shady lime trees a second vertical panel, this time fashioned from grey-green, white-veined verde issorie marble from the Italian Alps, was turned into a water feature. Gardens of the Italian Renaissance celebrated, indeed flaunted water, and this was a nod to those extravagant statements of wealth, power and control over nature. The recessed band of brass was repeated here, adding sparkle and shine to the gently falling water. It was the planting for me that most clearly demonstrated Tomasso and Paul’s restraint. There was an immaculate lawn which, despite being the pinnacle of ambition for many British gardeners, is barely ever seen at Chelsea these days. My Australian companion was dazzled; I was reminded of what an incredible backdrop a well maintained greensward can be for a good planting scheme. Let’s see more lawns at Chelsea next year please. In yesterday’s diffused sunlight the planting sparkled. The colours the designers had chosen were those of gemstones – peridot, citrine, emerald, sapphire and opal – vital, saturated and so redolent of May. Thankfully there was no homogenous mix of wispy, meadowy things here, but the sort of generous clumps one would plant at home. 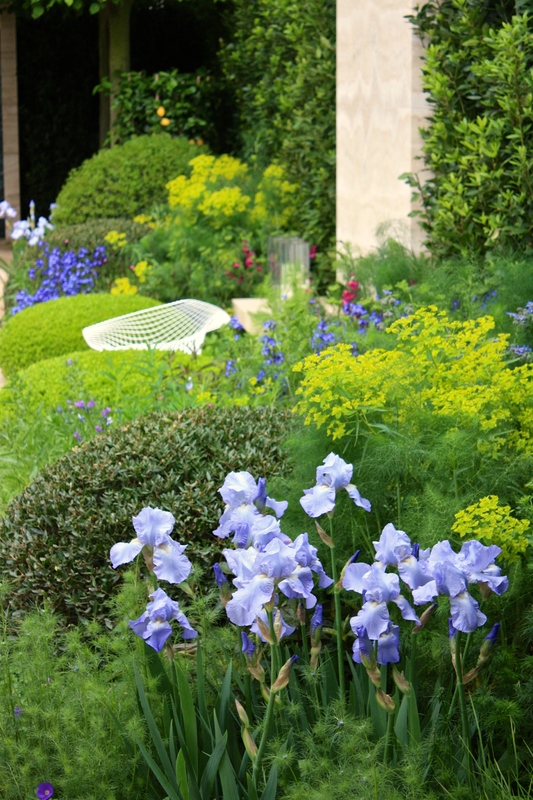 Stand out plants were Iris ‘Jane Phillips’ (an absolute classic, below), acid-yellow Euphorbia ceratocarpa, royal-blue Anchusa azurea ‘Loddon Royalist’ and magenta Gladiolus byzantinus, rising above misty cloudy of Nigella damascena ‘Miss Jekyll’ and Foeniculum vulgare. Paul Gazerwitz is quoted in The Telegraph as saying ‘There is always the temptation at Chelsea to show off and put in lots of stuff. We wanted to go for something simple, bold and punchy’. It was a good move which earned them a gold medal and had them firmly in contention for Best in Show. Sadly the pair missed out on that accolade to Luciano Giubbilei and Laurent Perrier, but to them I award my own prize for best show garden. Now, where are those hats…..? Tommaso and Paul’s international design practice del Buono Gazerwitz Landscape Architecture is based in Shoreditch, east London. In my next post I’ll be writing about my runner-up Chelsea show garden, The Garden for First Touch at St George’s by Patrick Collins. What a first class description of a stunning garden that I would dearly love to pack into my suitcase and transport back home. An exquisite balance of contemporary style and elegance. For me by far, best in show. Thanks Helen 🙂 Room for a gardener to look after it for you? I too loved this garden, although until now only seen on TV. Really lovely post and fabulous photos – how did you elbow out all the other visitors? 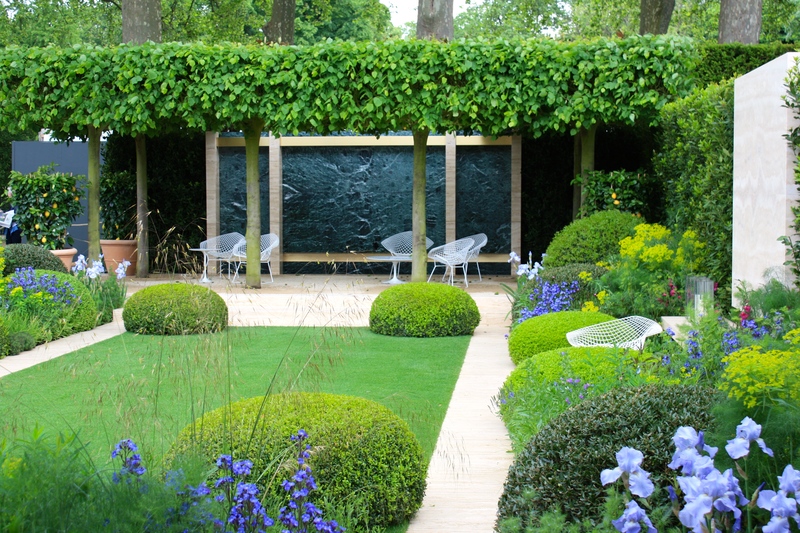 I’m not going to Chelsea this year until Thursday (latest ever, long story…) by which time I’m afraid I’ll be viewing it in the rain! A great post. Thank you so much for the photos and detailed description of this lovely garden. Yes, I love Monty too, such a calm, considered gentleman and lots of gravitas, which is what I think the programme needs. Thank you for commenting.